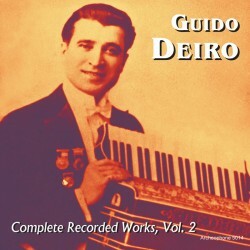 Volume 2 of Guido Deiro's complete recordings includes 25 tracks showcasing Deiro's mastery of both popular and classical material. The package includes a 24-page full-color booklet with extensive notes by free-reed scholar Henry Doktorski, meticulous restorations of the music, and personal photos provided by Guido's son, Count Guido Roberto Deiro. The tracks were recorded between 1911 and 1917 and include the only two accordion duets waxed by Guido and his brother, Pietro. Additionally, Complete Recorded Works, Volume 2 will be of interest to historians of vaudeville and films, as it features new revelations about the marriage of Guido Deiro and Mae West. In his detailed notes, Guido's son recalls his meeting with Mae West in 1959 when she told him the facts of her relationship with Deiro--the mysterious "Mr. D" mentioned in her autobiography, Goodness Had Nothing to Do with It. These are the things she never told any interviewer, and now the historical record is set straight. Visit Guido Deiro, Volume 2's expanded catalogue page to see the complete track listing, read an extended description, and listen to sound samples.